Every now and then something happens which makes me stop and take stock of my life, looking where I’m at and where I’m going. This time that ‘something’ was the birth of one of my best friend’s babies. It’s the first baby in my closest group of friends so it felt super momentous. We now have an extra little person to think about. We’ve gone from six girls to six girls and a little guy, and it feels pretty special. We’re all so invested in his life already and ready for the group dynamics to change. Our friend now, who already struggled with time management, has an extra responsibility, an extra person to care for. Sharing and watching her go through these major milestones makes this moment even more magical. It also makes me wonder what I want in the future. I used to firmly say I was never interested in getting married or having a family. It wasn’t something I ever dreamt of or imagined having. I didn’t care for a white dress and what I thought was just a piece of paper. Maybe that’s because my own parents are divorced or maybe it’s because I’ve always been so focused on what I wanted to do with my career that it’s kept my mind occupied. Either way, this year I feel my priorities for the future have shifted. Attending five weddings in one year can do that to you. I definitely think I’ve softened. I don’t feel so anti-marriage anymore. It was once a subject I would completely avoid talking about with anyone, especially Al, despite the fact that I’d nosily ask other friends and colleagues when they plan on tying the proverbial knot. I’ve even started to come round on the baby side of things. Shock horror. If my mum’s reading this her eyebrows will have vanished into her hairline. Although I still need time to get used to the idea of physically carrying another person inside, as that still freaks me out hugely. Al told me a couple of weekends ago that I dress like a walking texture toy for children and that’s why they love me. I was wearing my multi-coloured snake-print skirt, a striped top, blue faux-fur coat and red glitter boots. Each not only a different clashing colour but a different texture. I was my 3-year old honoury nephew’s (my oldest cousin’s boy) favourite play thing. And I do love playing with kids, I love listening to their nonsensical chatter, making them laugh and just having cuddles. Although right now, I can’t imagine having my own, full time. But I’m definitely not opposed to the idea anymore. In fact, I’ll go as far as telling you that Al and I might have even discussed baby names. Proof, if any, that my cold heart of stone is softening. Now quick, someone pour me a whiskey. 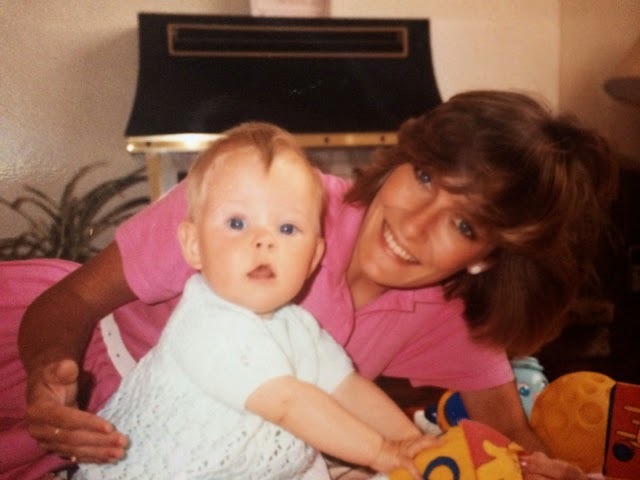 Oh, and I should say that that’s little ol’ me and my gorgeous mum in the photo.